I also have a book where I gather famous meditation quotes, written articles on meditation or quotes on spirituality that touch the longing in my heart. Sometimes when I want to meditate, but I feel a bit "dry", uninspired so to speak, I pick up my book and flip through the pages. There are always some quotes about meditation that get me inspired and help me go deeper in my meditations. I gathered the quotes and sayings that inspire me and have helped me over the last 25 years to create a sustaining, daily practice. Maybe you also would like to share your favorite quote on meditation. Please use the box below and share your quote with all the people that read this page. I will add it to the page. Thanks for sharing! you bring in more Light. Suffering is due to disconnection from our Self, others and God. Meditation is re-establishing, deepening and strengthening that connection. “The soul always knows what to do to heal itself, to free itself. “Prayer is you speaking to God. and it can be valuable to listen to a meditation several times. Having expectations in meditation or for meditation to deliver us a good feeling, a sense of accomplishment, is a direction that is not productive. Sometimes meditation is just hard work. Pick a consistent time of the day for your meditations. Remember the goal is not to be perfect - the goal is simply to focus on the practice of meditation, however that goes for you at a particular time. The rewards come from staying with it. "It's the journey that's important, not the getting there!" it is open to everything. "Meditation is NOT a way of making your mind quiet. buried under the 50,000 thoughts the average person thinks every day." It is the busyness that takes you from the light that you must avoid. You look to these things as excuses to not go within. A spiritually established life is not an easy task. But a materially satisfied life is an impossible task. What's encouraging about meditation is that even if we shut down, we can no longer shut down in ignorance. We see very clearly that we're closing off. That in it self begins to illuminate the darkness of ignorance. 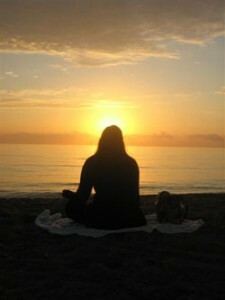 DO you have a great meditation quote you like to see added to this page? Your quote will appear on this Web page exactly the way you enter it here. You can wrap a word in square brackets to make it appear bold. For example [my story] would show as my story on the Web page containing your story.